Tomorrow, February 25, is National Adjunct Walkout Day #NAWD. What are you doing to mark this day without adjuncts? What are you doing for #NAWD? The chat will be led and facilitated by @N1academy. All adjunct, contingent, part-time, visiting, casual, and non-tenure track instructors, along with their allies and friends in higher education, are welcome to #AdjunctChat! Even if you do not readily fit into the above, #AdjunctChat is open to all! The more perspectives, the better we all learn with and from one another. Can’t make it during the live 30-minute chat? to add to and engage with the conversation. Want to facilitate an #AdjunctChat in 2015? You do not have to be an expert on the topic, but rather have an interest in something related to adjunct experiences with a desire to facilitate a live Twitter chat. More information about it may be found at How Can I Facilitate an #AdjunctChat? This entry was posted in Planning & Scheduling and tagged #AdjunctChat, #NAWD, National Adjunct Walkout Day on February 24, 2015 by Jeffrey Keefer. Let’s talk about this and see what ideas we can share in this final #AdjunctChat for 2014. The chat will be led and facilitated by @EFChandler. This entry was posted in Planning & Scheduling and tagged #AdjunctChat, planning, teaching and learning strategy on December 16, 2014 by Jeffrey Keefer. #AdjunctChat November 11 ~ What is the Breadth of the Adjunct Community? What is the Breadth of the Adjunct Community? How can we make the identity and breadth of the adjunct community more visible and understood? How do we empower our community to brainstorm possible solutions to common challenges? Proposal to develop the #AdjunctChat WP site as a forum to manifest and find solutions to the full spectrum of challenges faced by the New Faculty Majority beyond labor issues: new pedagogies, sharing of best practices, collegiality, convenient access to professional development, faculty-student interaction, ownership of IP, scholarship, and much more. Are you in? Is it possible for the (disaggregated) adjunct community to make heard its own strategies and proposals for solving some of our challenges–notably those that are not addressed through union representation? How do we do this, given concerns about job security and challenging time and resource limitations? Let’s talk about this and see what ideas we can share on a 30-minute AdjunctChat – 4:00-4:30pm EDT – on Tuesday, November 11. Q1 What types of resources (e.g., sites, blogs, chats, conferences) do you find most valuable for connecting, learning and sharing with your colleagues? #AdjunctChat? If you cannot make the synchronous chat, please share your answers to the discussion questions any time during the day and tag with #AdjunctChat. 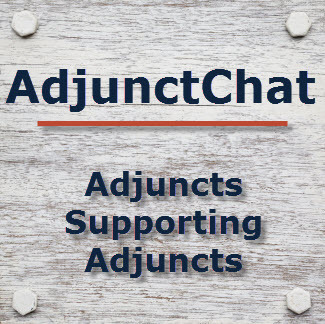 Want to facilitate an #AdjunctChat? You do not have to be an expert on the topic, but rather have an interest in something related to adjunct experiences with a desire to facilitate a live Twitter chat. More information about it may be found at How Can I Facilitate an #AdjunctChat? This entry was posted in Planning & Scheduling and tagged #AdjunctChat, metaphor, planning, teaching and learning strategy, threshold concepts on November 11, 2014 by Jeffrey Keefer. Do you teach tough topics, difficult ideas, or threshold concepts? ‘Threshold Concepts’ may be considered to be “akin to passing through a portal” or “conceptual gateway” that opens up “previously inaccessible way[s] of thinking about something” (via Meyer & Land). How do you do this, especially if you are an adjunct faculty member, often with challenging time and resource limitations? Perhaps you use visualization/scripting ‘what if’ scenarios as related strategies as well? Let’s talk about this and see what ideas we can share on a 30-minute AdjunctChat – 4:00-4:30pm EDT – on Tuesday, October 28. Q1 What are some of the difficult topics you find your students struggle with? #AdjunctChat? This entry was posted in Planning & Scheduling and tagged #AdjunctChat, metaphor, planning, teaching and learning strategy, threshold concepts on October 28, 2014 by Jeffrey Keefer. We will continue our recent open discussions on how we can leverage #AdjunctChat to support various needs adjuncts face, all through maximizing efforts and sharing opportunities. For #AdjunctChat to function and meet the needs of the many, many voices are needed. This entry was posted in Planning & Scheduling on September 30, 2014 by Jeffrey Keefer. Let’s try something new for today’s #AdjunctChat, let’s have it open and us facilitated throughout the day, and see how the discussion occurs! Want to see how we can have a conversation about raising adjunct issues to those who may not be open to them? How can we have a conversation, or raise awareness, of justice issues in a way that fosters discussion, or at least listening, by those who have other agenda? This entry was posted in Planning & Scheduling on September 23, 2014 by Jeffrey Keefer. Like every community with its ebbs and flows, those who engage with #AdjunctChat also need to explore what is working, what can be improved, and where we should go next. The beginning of the school year is a perfect opportunity for this. Q1 What works well for those engaging with #AdjunctChat? All adjunct, contingent, part-time, visiting, casual, and non-tenure track instructors, along with their allies and friends in higher education, are welcome to #AdjunctChat on Tuesday, September 16, from 4:00-5:00pm EDT. Even if you do not readily fit into the above, #AdjunctChat is open to all! The more perspectives, the better we all learn with and from one another. Can’t make it during the live 1-hour chat? This entry was posted in Planning & Scheduling and tagged #AdjunctChat, adjunct needs, planning on September 16, 2014 by Jeffrey Keefer.